Bare cast-iron vessels have been used for cooking for hundreds of years. Cast iron cauldrons and cooking pots were treasured as kitchen items for their durability and their ability to retain heat, thus improving the quality of cooking meals. Before the introduction of the kitchen stove in the middle of the 19th century, meals were cooked in the hearth or fireplace, and cooking pots and pans were designed for use in the hearth. This meant that all cooking vessels had to be designed to be suspended on, or in, a fireplace. Cast iron pots were made with handles to allow them to be hung over a fire, or with legs so that they could stand up in the fireplace. In addition to dutch ovens, which were developed with the onset of the Industrial Revolution, a commonly used cast iron cooking pan called a spider had a handle and three legs used to stand up in the coals and ashes of the fire. Cooking pots and pans with legless, flat bottoms were designed when cooking stoves became popular; this period of the late 19th century saw the introduction of the flat cast iron skillet. Cast iron cookware was especially popular among homemakers and housekeepers during the first half of the 20th century. Most American households had at least one cast iron cooking pan, and such brands as Griswold and Wagner Ware were especially popular. Although both of these companies folded and were integrated into other manufacturers during the 1950s, their cast iron pots and pans from this era continue to see daily use among many households in the present day; they are also highly sought after by antique collectors and dealers. The Lodge Manufacturing company is currently the only major manufacturer of cast iron cookware in the United States, as most other cookware suppliers use pots and pans made in Asia or Europe. The 20th century also saw the introduction and popularization of enamel-coated cast iron cookware. Cast iron fell out of favor in the 1960s and 1970s, as teflon-coated non-stick cookware was introduced to the public and quickly became the item of choice in many kitchens. Today, a large selection of cookware can be purchased from kitchen suppliers, of which cast iron comprises only a small fraction. However, the durability and reliability of cast iron as a cooking tool has ensured its survival, and cast iron cookware is still recommended by most cooks and chefs as an essential part of any kitchen. Cast iron's ability to withstand and maintain very high cooking temperatures makes it a common choice for searing or frying, and its excellent heat diffusion and retention makes it a good option for long-cooking stews or braised dishes. Because cast iron skillets can develop a "non-stick" surface, they are also a good choice for egg dishes, particularly scrambled eggs. Other uses of cast iron pans include making cornbread and pineapple upside-down cake. Most bare cast iron pots and pans are cast from a single piece of metal in order to provide even distribution of heat. This quality allows most bare cast iron pans to serve as dual-purpose stovetop fryers and oven baking dishes. Many recipes call for the use of a cast iron skillet or pot, especially so that the dish can be initially seared or fried on the stovetop; the dish is then transferred into the oven, pan and all, to finish baking. Likewise, cast iron skillets can double as baking dishes. Cornbread in particular is seen as a food item that is best prepared in a cast iron skillet: the iron pan is heated beforehand in the oven, the ingredients are combined in the heated pan, and the dish is then placed directly into the oven for fast baking. This differs from many other cooking pots, which have varying components that may be damaged by the excessive temperatures of 400 F (204 C) or more. Cast iron is a very slow conductor of heat and forms hot spots if heated too quickly, or on an undersized burner; however, it has excellent heat retention properties, and the entire pan will eventually become extremely hot, including the iron handle or handles. Types of bare cast-iron cookware include dutch ovens, frying pans, deep fryers, tetsubin, woks, potjies, flattop grills and griddles. Heat oil in skillet, over medium heat. Combine canned salmon, egg, 1/4 cup bread crumbs, garlic powder, parsley, seafood seasoning, salt and pepper. Form into 4 patties. Fry patties until golden brown, about 3 to 4 minutes on each side. Serve on toasted bread or buns and top with your favorite toppings. Enjoy! Welcome! Happy to have you here. I'll visit soon. Thanks! 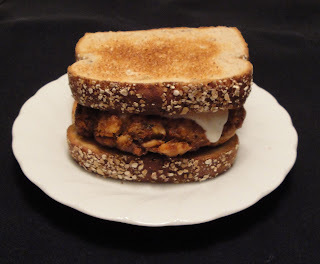 This looks fantastic, I like how you used the Texas toast-yum! I do have quite a bit of cast iron but only use it in the oven due to my stovetop. It also comes in hand on the outdoor grill. Liked reading about the history of cast iron. Great post! That looks soooo good! I love salmon! I've been dying to try salmon burgers. This is a wonderful recipe Christine. I love salmon burgers. They seem special but are pretty easy to put together. Plus they are good for you. I love the idea of hanging all of the pots and pans. I cannot help but thinking of Julia Child's kitchen wall. Salmon burgers sounds delicious! I would never have thought of making burgers out of salmon, a great idea indeed! I love cooking in cast iron...but most of mine is enameled...your burger sounds great. I enjoy stopping by your blog and getting a dose of food and cooking history. I'm a cast iron fan. There's always at least one heavy, cast iron frying pan sitting on my stovetop ready to go. The sandwich sounds fabulous with canned salmon cutlet. I would actually love some side salad with it as the lunch! Yum! These look and sound great! Your salmon burger sounds delicious. First time visiting your blog, very nice! I love Julia Child's kitchen. Her kitchen is now at Smithsonian Museum. Welcome! Happy to have you here. I'm allergic to salmon, so I can't indulge, but I have 4 cast-iron pans that I absolutely treasure! I love a good salmon burger! Salmon are truly amazing fish. Brilliant! I LOVE salmon, and it's so good for you. Love the use of the skillet too, I have quite a few of those. That would make a fabulous, super-hearty lunch. I love salmon burgers and I order them often when I see them on menus at restaurants. I need to try making them myself sometime! Great recipe! I love my cast iron skillet and the older it gets the better it is. My husband would love ths burger, so that means I'll have to make it for him. Sadly, I don't have any cast iron pans, I have learned that I need a couple though. Great post, the salmon burgers sound amazing!